The community of F ron-goch, near Bala, will come together today [Saturday, 11 June] to commemorate the centenary of a significant event in its history when over 1,800 prisoners from Ireland were brought to rural Wales. 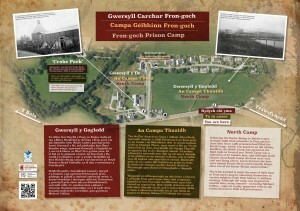 A camp at Fron-goch had already been used for German prisoners, and on 11 June 1916 Irish prisoners arrived following the Easter Rising. They remained in Fron-goch until December that year. 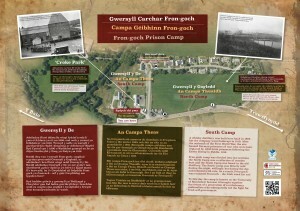 The community event at Fron-goch, involving the local school which is built on part of the camp’s site, aims to build awareness and understanding locally about the area’s history during this time. It includes an exhibition at Ysgol Bro Tryweryn, walking tours of the site and a series of speakers including the Ambassador of Ireland, Daniel Mulhall. The event, facilitated by Snowdonia National Park Authority, is part of the Cymru’n Cofio Wales Remembers 1914 – 1918 programme of events which commemorates key global events which took place during this period and their impact on communities in Wales, including very rural areas such as Fron-goch. First Minist er of Wales Carwyn Jones said: “Cymru’n Cofio Wales Remembers 1914 – 1918 provides an opportunity for young people to understand their history, and to find out how their local area was affected by the tumultuous events which took place in the world between 1914 and 1918. There is no part of Wales which was not touched in some way during that time, and it is important for communities to come together and commemorate these events.